“NO HOSE. NO COMPRESSOR. NO GAS. REQUIRED TO OPERATE.” This is how Porter-Cable describe their Lithium-ion cordless nailer series. As we promised in our previous post DEWALT DC608K Cordless Brad Nailer Review here we are again with another review of best cordless brad nailer you can buy right now. This time we take a close look at PORTER-CABLE PCC790LA 20V MAX Lithium 18GA Cordless Brad Nailer. You can find a great variety of Lithium-ion or NiCad powered cordless brad nailer with comparable fastening power of a pneumatic brad but heavy weight of these tools turning out to be an Achilles heel to become perfect replacement for pneumatic nailer. 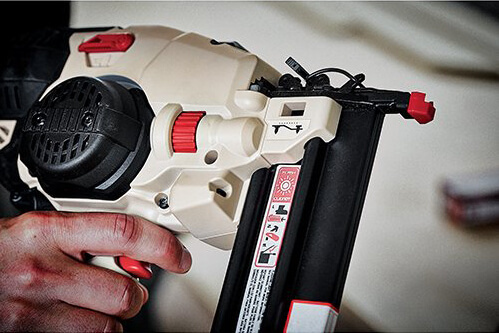 Though any brand is yet to launch a lightweight battery powered brad nailer, PORTER-CABLE created the lightest Lithium-ion 18GA cordless brad nailer which is PCC790LA. Apart from being the lightest in its class, Porter-Cable PCC790LA also sports amazingly high-quality design and performance feature. PCC790LA is the result of well-thought-out design by Porter-Cable. It is powered by 20V Lithium-ion battery and requires no loud compressors, air hoses or expensive gas cartridges. 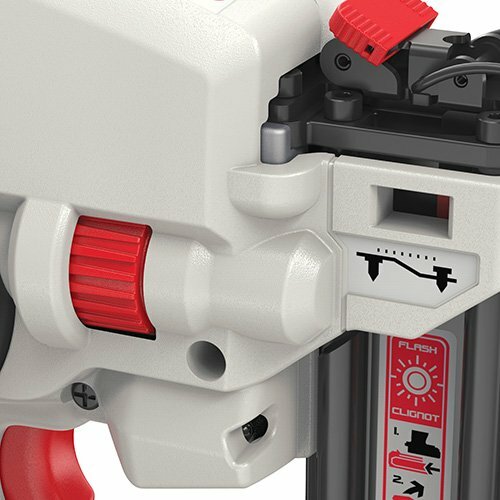 1.5 Ah (Amp-hour) battery supplied with the nailer can store enough energy for 450 shots per charge. To fire all those shots Porter-Cable PCC790LA has purposefully built motor to provide consistent firing power into various materials and climate conditions. We found this device to be well-balanced for application like finishing works, furniture construction, sub-flooring, installing various runs of poplar, pine, and maple trim, and other works associated with brad nailer. You will notice this cordless brad nailer from Porter-Cable is built with ideal brad nailer features we recommended in our buying guide. DIYer and home user can start brad nailing instantly with PCC790LA 18 gauge cordless nailer. Professionals will highly appreciate this nailer when optional 4A capacity battery offered by Porter-Cable is included to extend firing capacity up to 1300 shots per single charge. We have plenty more to share on PORTER-CABLE PCC790LA 20V MAX Series Lithium 18GA Cordless Brad Nailer, find out is this the right brad nailer for you. Overall dimension of the tool is almost identical with comparable cordless brad nailer but at first look head seemed bigger and bulky from other cordless brad nailer we reviewed. Some user may find it bit cumbersome for working in corner spots and placing nose tips within 2½ inches of wall surface may also find difficult. However PCC790LA’s lightweight body and optimal center of gravity help user to hold the nailer in multiple positions with comfort that reduce user fatigue. Its compact design is plus point for working with this tool at any time at any place. Porter-Cable installed a ergonomic grip that will fit in almost any hand making the usage more comfortable. Lithium battery unit is located under the grip handle is easy to open and replace with sliding action. We liked Multi functional dual LED lights for workspace illumination and error indication. What you can shoot with this nailer? You can shot ⅝-inch to 2-inch long brads to any hard and soft trim with ease. It can handle various length of brad nails supported by the magazine. The magazine itself can load upto 100 fasteners. Loading and unloading operation is straightforward – press red magazine button, slide it down, place nail and slide up to close. You can set the depth of your fastener with the depth of drive dial. Depth adjustment works smoothly and the indicator can visibly show you when depth adjustment is needed. Sequential firing mode of PCC790LA found to work greatly with correct depth setting. However Bump fire mode is not available for this nailer may disappoint some user. 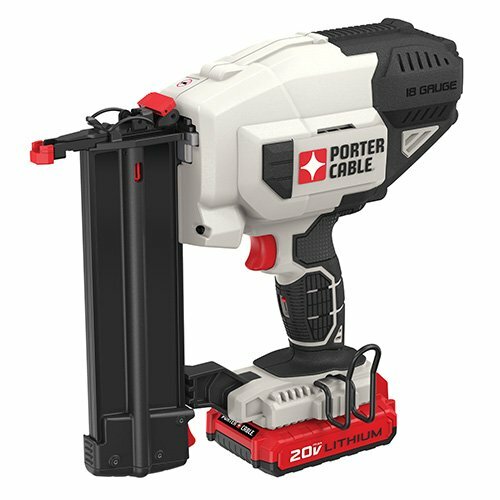 Though tool-free jam clearance system has become mainstream for cordless nailers, we found Porter-Cable PCC790LA has the most perfect design. Unfortunately we got only one chance to use jam clearing lever and release latch as the nailer works so well, it hardly jam. If you experience one, just remove battery, pull the red lever and open the latch on the nose to clear jam. It’s that simple. How 20V Max series is different from other Lithium-ion powered brad nailer? Depth of the drive in most lithium powered brad nailers we tested before tend to go shallow depth as battery power near to end. In Case of Porter-Cable PCC790LA, we got consistent depth for 18 gauge brads till battery last when powered by 20V Max lithium battery. The kits comes with 1.5Ah PCC680L Battery and PCC691L Charger that can full charge in in 65-200 mins. We did not find any low batt indicator on the nailer. We found this brad nailer has features that are designed for convenience, flexibility and user friendliness. LED lights in the front are real convenience when working in dark spaces and for illuminating work area. 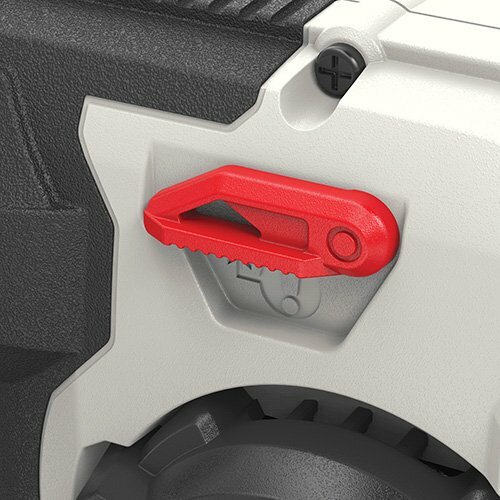 You will find the belt clip will be handy to the tool strapped while not in use. Not to mention unlike most pneumatic models, this tool can run with low maintenance and doesn’t require oil. No mar tip on the nose piece prevent work surface damage while trigger lock stop unintentional firing. Anyone interested to buy the nailer would like to know what kind of fastening job Porter-Cable PCC790LA can perform. Theoretically it can be used in all kind of brad nailing job. Porter-Cable made power tool is equally popular in professional and home user segment. PCC790LA is no exception in this regard, however cordless nature of the tool and lots of safety feature built in make it the safest bet for home user. Professionals can also utilize the tool for whole day trimming with few battery pack lined up in the queue or using PORTER CABLE PCC685L 20V MAX Lithium Ion 4.0-Amp Hour Pack battery that can nail up to 1300 per charge. Please note for charging you will also need PORTER-CABLE PCC692L 20V MAX Lithium Ion Charger both sold separately. Best way to take buying decision is to ask previous buyer about their experience. Fortunately these power tools are available in plenty of online retail store and huge number of actual buyers submit their reviews on the tool to help others looking for the product. So you don’t have to rely on sales pitch and rather read reviews before taking final buying decision. Luckily we already did that for you, we analysed total 424 reviews both positive and critical. We found Porter-Cable PCC790LA received average 4.54 out of 5 star rating. Not everyone found the tool to be that good, our research indicate at least 5% buyer is not satisfied with the tool performance. Read customer feedback on PORTER-CABLE PCC790LA 20V MAX Series Lithium 18GA Cordless Brad Nailer, find out is this the right brad nailer for you. The core advantage of PORTER-CABLE PCC790LA is it can do exactly everything we reviewed here. Nothing more nothing less. It can do brad nailing task as advertised but lack of tool case, dry-fire lockout and bump firing mode are few things the manufacturer could add to make it more appealing. We found this gun has ideal application in renovation and remodeling work around the house, remodeling contractor doing smaller trim job, upholstery, and furniture building where brad nailer are used for fine finish. Carpenters and professional contractors will definitely like Porter-Cable PCC790LA, as they can visualize the benefit of a cordless brad over pneumatic brad nailer for its ability to work without dragging a hose or listening to a compressor hum.